This article is about the minigame that appeared Mario Party and Mario Party 2. For the item with the same name, see Grab Bag (item). 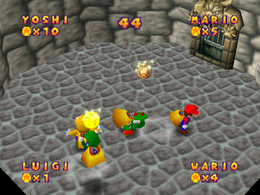 In both games, it involves players pressing the to grab other players' bags and steal their coins (in Mario Party) or mushrooms (in Mario Party 2). In the original game, what the players' coin totals are at the end of the minigame will determine what they will possess on the board game. 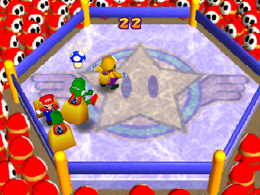 In Mario Party 2, each player starts with 5 mushrooms, and one player has a Golden Mushroom worth 3 points, and the player with the most at the end of the time limit is the winner. Game Rules – "It's a Coin-stealing free-for-all! Grab player's bags by pressing repeatedly. When grabbed, press to escape." Advice – "If you get grabbed, you can escape without losing any Coins, by repeatedly pressing ." Game Rules – "It's a Mushroom Grab Bag! Grab opponents' bags and pull mushrooms out by pressing the Button repeatedly!" Gappori Yokodori Koin Gappori signifies a large amount of money. Yokodori Koin means "Coin Snatching". Gappori Yokodori Kinoko Yokodori Kinoko means "Mushroom Snatching". This page was last edited on November 14, 2017, at 09:00.